"Time's Up! ": BE WISE!!!!! Is the child really missing? BE WISE!!!!! Is the child really missing? You could be liable if you are not wise to situations involving missing loved ones, especially children!! While this may seem harsh...it is important to protect those whose photos are going around saying they are missing. We do not know if they are being stalked or legitimate missing loved ones? 1. We cannot post missing children without a registration at our org so that we can verify with police if it is a minor under the age of 18. Their immediate family/guardian (who have legal custody) must register them and will be asked to sign a form allowing us to distribute the photo of their minor child. THE ONLY EXCEPTIONS are posters from the National Center for Missing and Exploited Children....and media news alerts of missing children. 2. 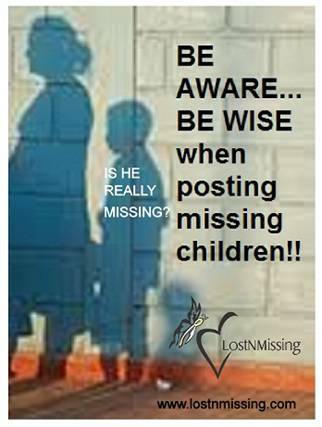 We cannot post missing adults...EVER...without a police contact phone number to verify they are missing and only will share posters that contain police phone numbers. 3. Missing Adults who have alerts in the media news can be posted. If you have a friend, or a friend of a friend, who has a missing minor child under 18....please tell them to call 1-800-THE-LOST right away (NCMEC) and their local police department. Advise them if they are going to post their missing child's photo to use the name of the reporting police agency and the case number, otherwise...it could be viewed as someone just "stalking" someone or a non custodial parent , or otherwise, trying to find a child's location. THIS IS CRITICAL. Be wise. Protect our youth. ASK for this info before taking a "friend" on Facebook's word that their child is missing. We recently saw this happen not even two weeks ago in which the person looking for a child was NOT the legal guardian and portrayed as if the child was a runaway from their own home...when in fact upon police confirmation....that person did not have custody nor rights to that child and the child was with a parent in protective custody. BE WISE. Cynthia! Wow! This is a great post...a word to the wise... I'm still in my infancy in understanding the "far reaching powers" of social media and always defer to those who know better than I. Your advice means that everyone has to be vigilant ..and not let their heartstrings rule their head when a child is involved!